Should the Eugene School District Sell Civic Stadium to the City of Eugene? 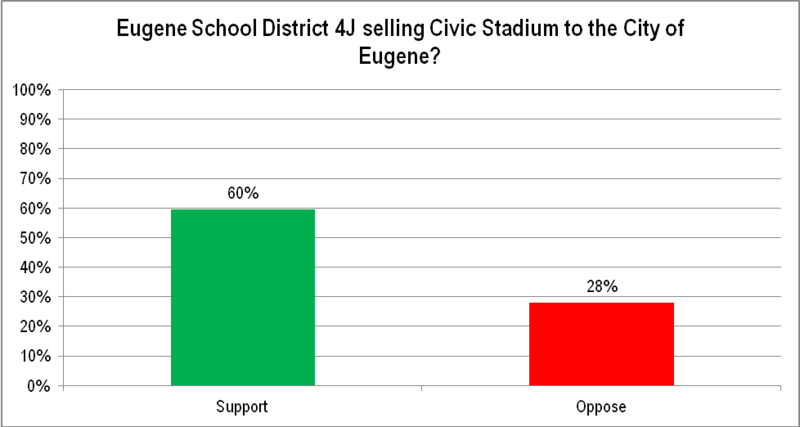 There is strong support for selling Civic Stadium to the City of Eugene. Of course, this question doesn’t touch on any of the issues of how actually to get that done. QUESTION: Do you support or oppose Eugene School District 4J selling Civic Stadium to the City of Eugene? METHODOLOGY: 200 live telephone interviews of likely 2014 Eugene General Election voters were conducted September 23-24, 2013. The margin of error at the sample median is 7 percent. Category: Eugene and Lane County, Political | Comments Off on Should the Eugene School District Sell Civic Stadium to the City of Eugene? Voters who voted more often generally turned their ballots in earlier. METHODOLOGY: Cumulative turnout by date as a share of total turnout. Vote propensity is measured by how many of the past four primary and general elections (2010 Primary, 2010 General, 2012 Primary, and 2012 General) the voter voted in. The range is from 0 to 4. SOURCES OF DATA: Lane County Elections; Labels and Lists, Bellevue, Washington. Voters who turn out more frequently also return their ballots earlier. METHODOLOGY: Cumulative turnout as a percentage of voters by date. South Eugene voters returned their ballots later than voters in other parts of the city. South Eugene includes wards 1, 2, and 3, North Eugene includes wards 4 and 5. West Eugene includes wards 6, 7, and 8. West Lane and Springfield voters generally turned their ballots in earliest. South Eugene voters generally turned their ballots in later than other districts. Rural voters voted earlier. Eugene voters voted later and significantly closed the gap with rural voters at the end. Springfield voters were the least likely to vote. Republicans tended to return their ballot slightly earlier than other voters. Older voters clearly turned a greater share of their ballots earlier than younger voters. Men and women returned ballots at almost exactly the same rate. North Eugene had the highest turnout and ballots were returned fastest. West Eugene turnout exceeded South Eugene turnout until the latter caught up at the end.